Would you be surprised to see an Ewok at the other end of this trail? Photo courtesy of Lisa Parsons. This past Saturday, May 11, locals and trail enthusiasts gathered to celebrate the opening of the brand spankin’ new loop trail through Cedar Creek Park, an Ewok-like forest paradise nestled between Covington and Maple Valley in unincorporated King County. Cedar Creek Park is actually 2 parks: King County’s portion, called Cedar Downs, and the City of Covington’s adjacent Cedar Creek Park. 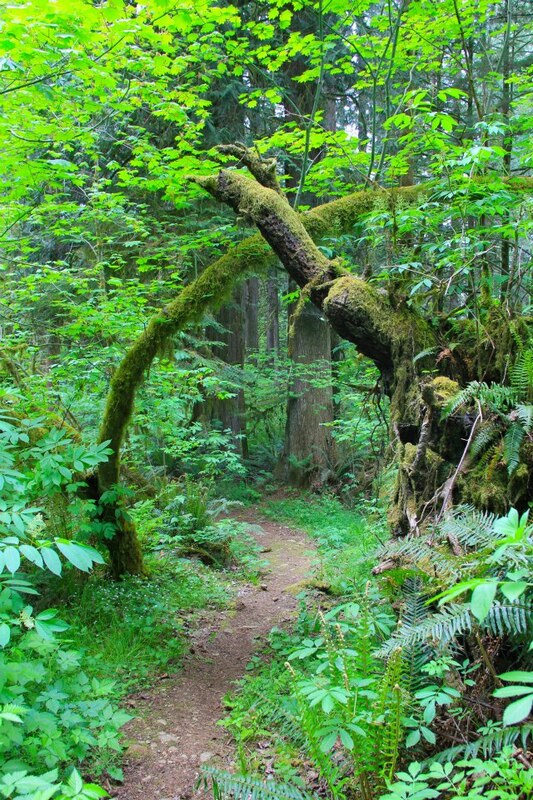 Together, the two parcels make a nearly 120 acre green space, featuring towering Cedars, Douglas Firs, and Maples along with two branches of the salmon-bearing Jenkins Creek, a pond, and more than 300 species of Rhododendrons. This green little corner of the world attracts eagles and herons, river otters, deer, and the occasional elk. 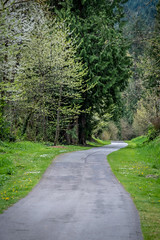 The new 1.5-mile-long loop trail is the result of funding from King County Parks’ Community Partnerships and Grants (CPG) Program to the Middle Green River Coalition and the Friends of Cedar Creek Park, which harnessed volunteer power and community resources to help get the loop completed. The event also dedicated a memorial bench to Gary Patrick, a community member and former Maple Valley City Council Member who passed away in 2003. It was largely through Gary’s tireless efforts that the street end was protected as the trailhead access point on the Cedar Downs side of the park. A fitting tribute, the bench sits beneath a giant Cedar tree. Congrats and many thanks to the Middle Green River Coalition, the Friends of Cedar Creek Park, and all the folks who helped make this trail happen – we couldn’t do it without you! Couldn’t make it to the event and want to experience more Ewok splendor? Catch a quick video recap here or photos here. Get a park map and sign up to get involved on the Friends of Cedar Creek Park website. Previous Post Field Notes: Your opportunity is knocking at the Women in Trades Career Fair!